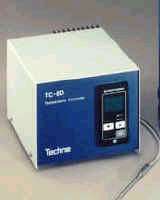 The Techne Model TC-8D digital controller is designed to improve the temperature stability and temperature setting obtainable with the energy regulator which is supplied as standard with SB Series fluidized baths. The TC-8D is a self-contained unit and is supplied with a type K' thermocouple which fits into the sheaths on SB series baths. The TC-8D controller is highly recommended when the application requires an operating temperature above 300Â°C.